A few years ago I worked on a photographic project involving still life. The linking element in the photographs was a cactus whose growth I recorded for over three years. 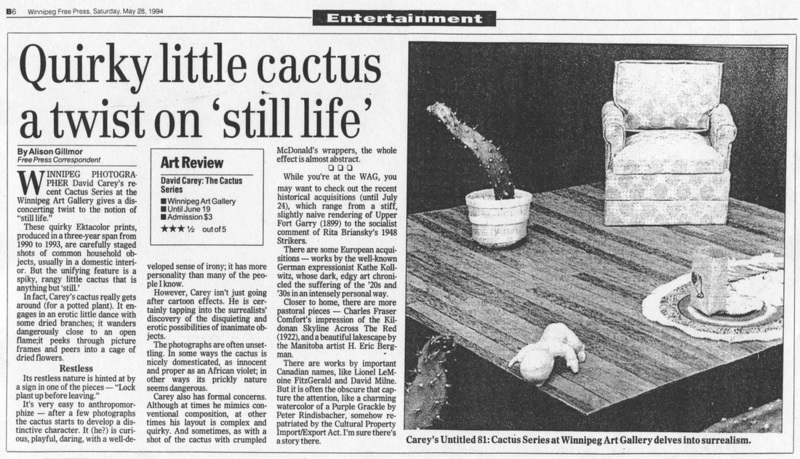 Sometimes the cactus was the center of attention; at other times it was a small element in the composition. I am very interested in the process of building (creating) a photograph step by step, element by element; putting together a collage of objects and colors where all elements are crucial to the integrity of the whole composition. I am striving for a democracy of values where every piece of dirt, dust, thread, fold in a cloth or shadow is an integral part of the photograph. No object is given priority over another. Foreground, background and middleground items are all important. Support structures, clamps, clothespins etc. are left visible where normally they might be cropped out for the sake of neatness. I find it interesting the way different objects have different emotional impacts in the photos. Replace one compositional object with another of the same size, shape and color and the effect is not the same. It is the built-in associations and feelings connected to objects that make the difference. In most cases my choice of what goes into a photograph is intuitive, guided by unconscious motivators. Many of the photos reflect my thoughts and feelings at the moment - sometimes serious, sometimes playful. Others are variations based on childhood memories - recollections of a favorite book or toy or of things not so pleasant.